When you enable the SCAWS service, by default, only few images or none are available for virtual system. 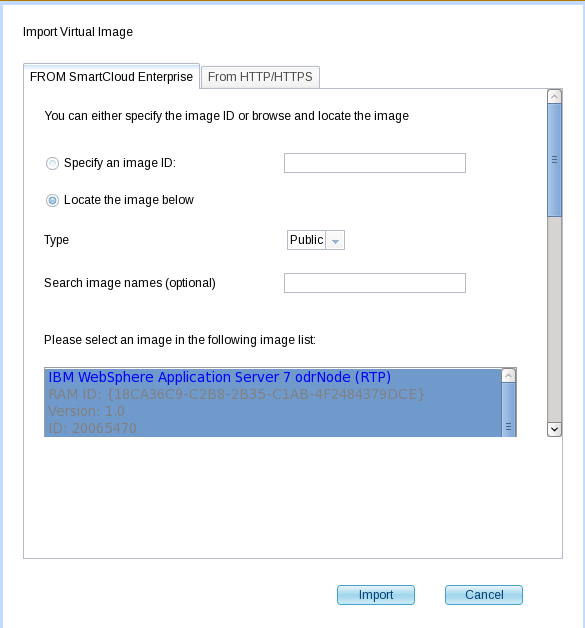 IBM provides a number of images for R1.0 but you have to import them from the SmartCloud Enterprise catalogue. First, your company policy maybe only authorize the use of certain software and version and thus you don’t want that users will be able to create pattern based on unauthorized images. Secondly, each image contains a number of software for which you have to accept the License before using them. Select the image you would like to import and click import. The download of the image into your SCAWS environment starts. Once it is downloaded you still need to accept the License. Click on each product to accept the different licenses: and then click ‘OK’.